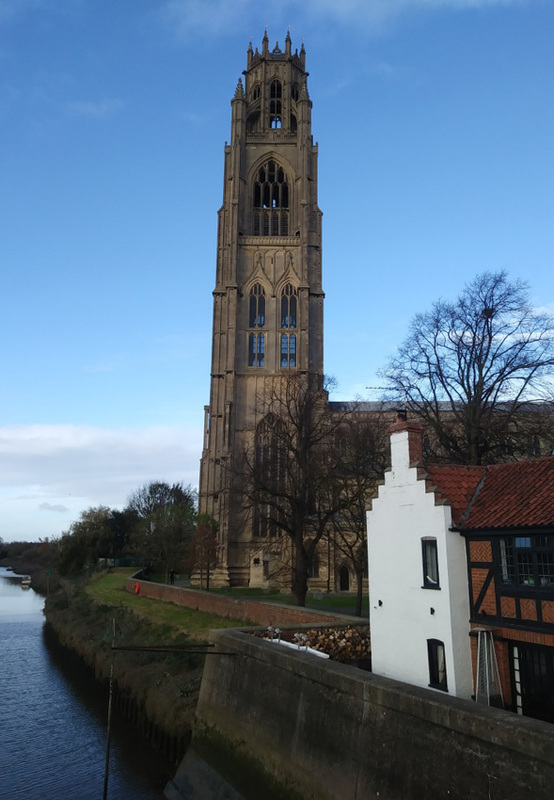 “We’re on the road again,” I said to my walking friend Peter as we stood with our backs to Boston’s famous ‘Stump’ church tower early on a chilly November morning. 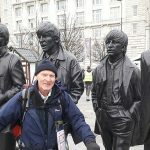 Ahead lay four wonderful days walking to escape the vast flatness of the Lincolnshire fens and on to higher ground as we headed for Margaret Thatcher’s home town of Grantham and beyond. Four further week’s walking in January, March, April and June would take us through winter and out in to spring and summer and so on to the North Wales resort of Barmouth on the Irish Sea. 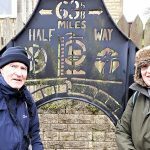 We were starting a new 280 miles cross-Britain trail created as a fund raiser by the Macmillan cancer charity and as a sequel to their now extremely popular Boston to Abbotsbury in Dorset long distance trek. “I wonder what small adventures we’ll have along the way ?” I remarked as we hoisted our packs onto our backs, took up our walking poles and set forth, soon to pass a cluster of fishing boats on the banks of the River Within estuary. They were the final echo of the 13th century when Boston rivalled London for trade with Northern Europe. And strangely enough it was beyond Kirton, with its eye catching metal village sign, that we stopped in a cafe and met a local, now living in The Netherlands, who said how lucky we were to have the legal right to roam. We decided on lunch in the oddly named village of Wigtoft where our trusty Ordnance Survey map told us there was a pub, but it was nowhere to be found. Then, as if on cue, a council lorry driver arrived to empty the bins and told us the pub had closed some time ago so it was on to our often used plan B and sandwiches in the nearby parish church porch. “There are tables inside,” invited a lady who’d popped in to borrow the church wheelchair. We got chatting about the state of the world and she told us the silver lining story of how her ambulance driver son had thrice resuscitated a badly injured tourist on the way to hospital after the London tube bombings and had later attend her wedding in Australia. It was time to go and on leaving this quiet village we crossed the noisy A16 Boston to Spalding road and were soon on a quiet lane in the midst of a dead flat landscape sewn with vast swathes of cabbages and brussels sprouts for as far as the eye could see. All were destined for our ravenously hungry supermarkets so would they all have to be cut by hand come Christmas and if so would our leaving Europe have an adverse affect on their cropping? I wondered. 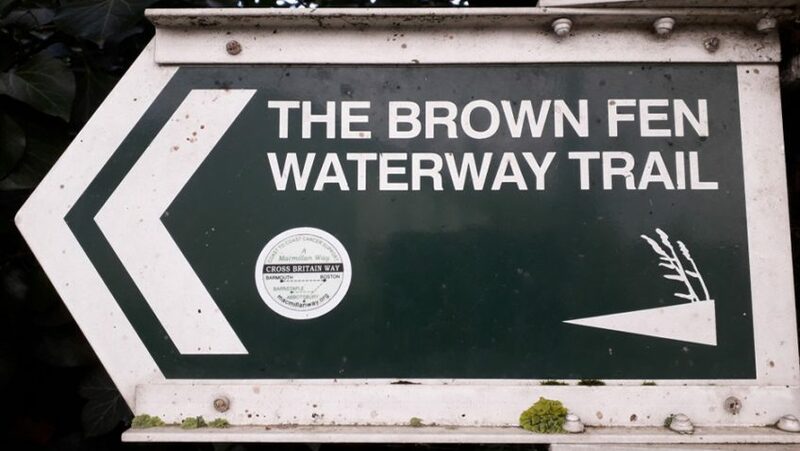 Further on we spotted tiny ‘Cross Britain Way ‘stickers, many hundreds more of which, would help guide us safely onwards. 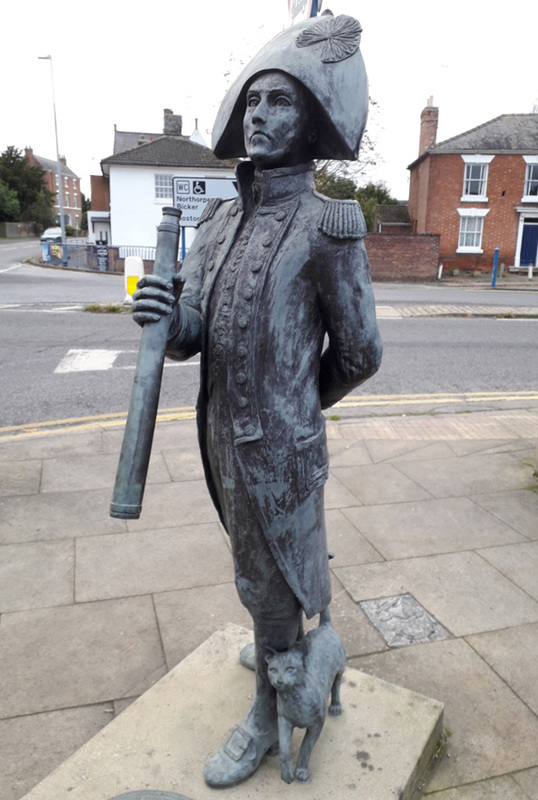 Storm clouds were gathering as we plodded into Donington to meet Matthew Flinders holding his telescope with his faithful cat Trim at his feet and standing quietly in the market square. This famous explorer was the first to circumnavigate Australia, charting and naming most of the southern coast, including Cape Donington, and there are more statues of him ‘down under’ than any other historic figure, with the exception of Queen Victoria. The heavens were about to open so we took refuge in the Black Bull where we were welcomed by a roaring log fire and a friendly crowd of locals. This was just perfect because our B&B was close by and the pub served evening meals. Early the next morning we were back on the trail and again surrounded by vast arrays of crops as we followed a small lane which our Cross Britain Way guide book told us would eventually end at the South Forty Foot Drain. But because we were chatting and I was not paying attention to the map, we went straight ahead on a sharp bend and ended up in a deserted farmyard with no sign of the drain which was a substantial waterway helping to drain the fens. It took a few minutes to figure out where we’d gone wrong and to return to the lane which in fact continued for another two miles. It was a sharp reminder that paying attention was preferable to many a wasted step. The way now led across more vast tracks of open land, through the picturesque villages of Horbling and Billingborough but the ground was rising as we trudged up the long hill to journey’s end in Folkingham. The spreading rays of sunset turned the church clock face to gold as we found our way to our B&B in a magnificently converted barn and as luck would have it, there was a village pub serving supper. 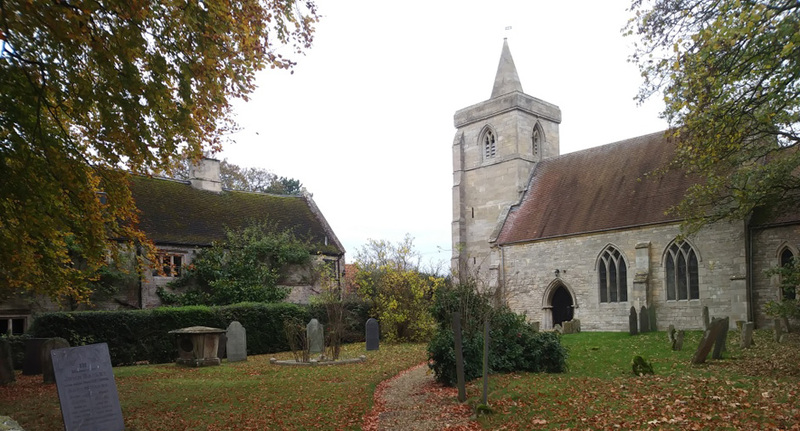 The following day with the fens now far behind us, we found our way along quiet lanes and country paths, through Sapperton, where we sat for coffee in the churchyard, and Ropsley and finally on to Old Somerby where we left the trail to walk into busy Grantham for the night. By a stroke of luck our hotel was opposite the Grantham Canal along which we walked for five miles the following morning to rejoin the trail at Woolsthorpe Wharf. Here we met Grantham Canal Society members George Gee, 82, Alan Brown, 68, and supermarket employee Gemma Batalla 34 from Barcelona about to spend the day clearing weed. 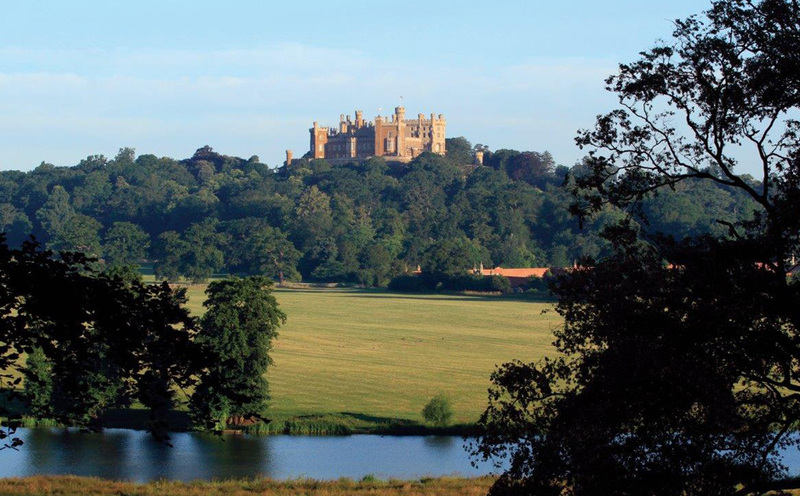 Journeys end was now in sight and after passing through Woolsthorpe by Belvoir and close by magnificent Belvoir Castle, now a conference and weddings venue, we left the trail to walk into nearby Redmile where we’d arranged for a taxi to take us the 60 miles back to Boston. 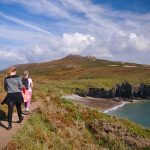 Hopefully we’d be back in January for more small adventures on this wonderful new Cross Britain Walk. 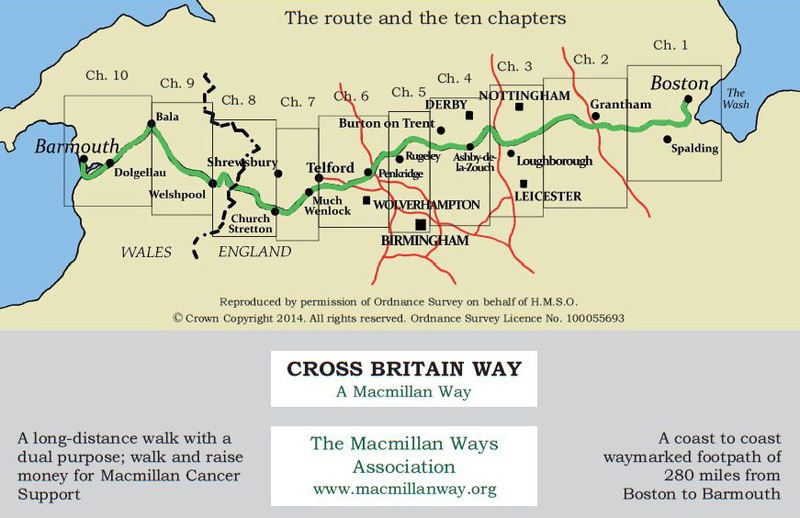 The Cross Britain Way guide book, published by the Macmillan Ways Association, plus the relevant ordnance survey maps are essential for this walk. All our accommodation was of an excellent standard so necessary after hard days on the trail. We stayed at The White Hart Hotel, Boston, Lincs, PE21 8SH – 01205 311900; Browntoft House, Donington, Spalding PE11 4TQ – 01775 822091; The Barn, Spring Lane, Folkingham, NG34 0SJ – 01529 497199 and The Premier Inn, Grantham, NG31 7JT – 01476 850603.